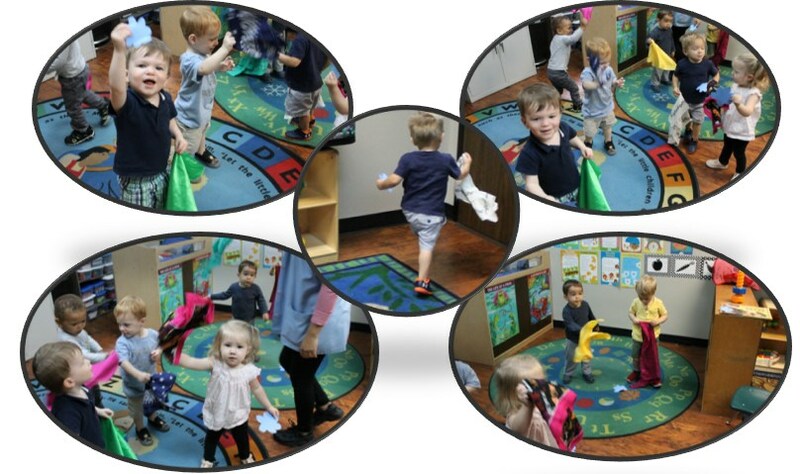 Our Turtles students are on the move, strengthening their gross motor skill development with the flower sway activity! They got to march to melodic music while waving a scarf and picking up flowers. Why encourage Toddler students to participate in gross motor skill activities? Gross motor skills are needed to teach toddlers walking, jumping, turning, balancing, reaching, etc. It is important that they are able to grasp these skills to be able to participate in play and developmental activities. How excited were students to participate in the flower sway activity? The Turtle students were very curious to join in the activity. They were very attentive in observing the demonstration. Their excitement built as they showed-off their marching skills with their classmates. The students were provided scarves in different colors and patterns and then instructed to wave the scarf in the air. Next the students were told to stand and march in place, while waving the scarf. Then the students were guided to march around the room waving the scarf. The music was turned on and the students were encouraged to try marching to the rhythm of the music. Next the students were instructed to try picking up the flowers while marching and waving the scarf. The flower sway activity uses building and strengthening concepts to teach the students to layer and combine movements. At this age and stage of development the students are very observant and try to emulate the movement of those around them. The flower sway activity provides structured movement in stages, giving the student the opportunity to grasp and internalize each type of movement. And as they gather an understanding for the movement then they are encouraged to layer another movement. These skills are important as they lead into the development of the fine motor skills needed as they grow and progress to the Lambs class. The students had fun. They truly enjoy the opportunity to explore and move. Try similar activities at home. ELP Penguins are building on their motor skills and practicing repetition, while exploring cause and effect. In the “Sun In the Sky” activity, the students were given the opportunity to take turns to roll their ball down the ramp. Why teach toddlers, ages 15 – 18 months old, about cause and effect? Cause and effect is an important concept to introduce to toddlers, as they develop their motor skills. At this age they are very active as they try to make sense of the world around them. This simple process of picking up a ball and letting roll down a ramp provides a tactile, visual, and sensual experience with objects going up and coming down. How excited were students to participate in the activity? Because they are so young, everything feels new and unknown. Thus, they are more curious than excited to try new things. They watched in rapt anticipation, as the props for the activity were arranged at the start of the lesson. 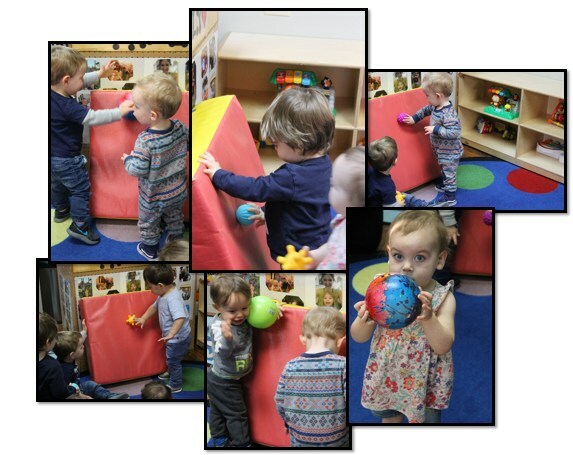 The activity allows the toddlers to test their understanding of downward motion, coordination, and emulation. After the demonstration that provided visual and audio cues, the toddlers took turns at the ramp. Initially, the toddlers allowed the ball to roll down the ramp a few times. Some toddlers switched tactics, without prompting, decreasing the rate of the ball rolling down the ramp by applying pressure from their hand and tracking the process down the ramp. Other toddlers, held the ball up high and released it, which increased the rate of the ball’s fall to the floor. The learned result from performing certain consistent actions is a prerequisite to long-term cause and effect used in science and engineering. This activity has a direct application for activities on the playground. Often the toddlers want to get on the slide but are hesitant, fearing the swift downward direction and speed of the gravitational pull when sliding. This activity provides the toddler with an objective view of that process. Our Penguins are curious and fast learners and they are also very creative. 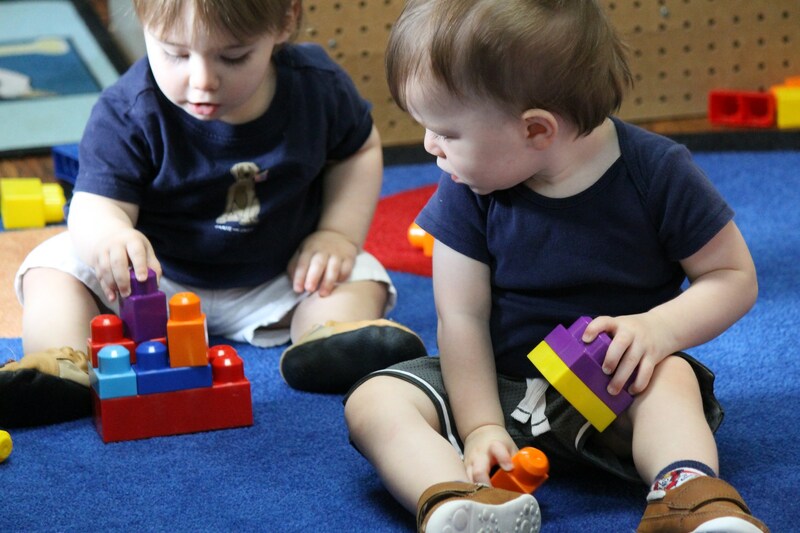 It is exciting to watch them build on their discoveries as they play and learn. Our Preschool Plus students are counting to 12! The students have learned 2 numbers a month since the beginning of the school year. And now they can count to 12! The students spent the day reviewing the numerical order of the numbers 1 through 12, through various activities. At the end of the lesson they worked independently, using a set of cheerios to count the dots on a page! The age range for Preschool Plus is 36 months through 47 months who are not eligible for Pre-K 3 by September 1st. Why teach (numbers and counting) to students in (Preschool Plus)? How excited were students at the start of the project to learn and explore the topic? How confident were students to present their findings/display a working knowledge of their acquired skillset? At the Preschool level, everything is exciting and new. The students were eager to try the counting to 12 activities. They had fun, shouting out the answers to flash cards, counting the fish by groupings, and learning the English and Spanish pronunciation of the numbers. By the end of the lesson, they were counting the numbers aloud on their own! The students are learning to associate shapes, sounds, and patterns to recognize numbers. 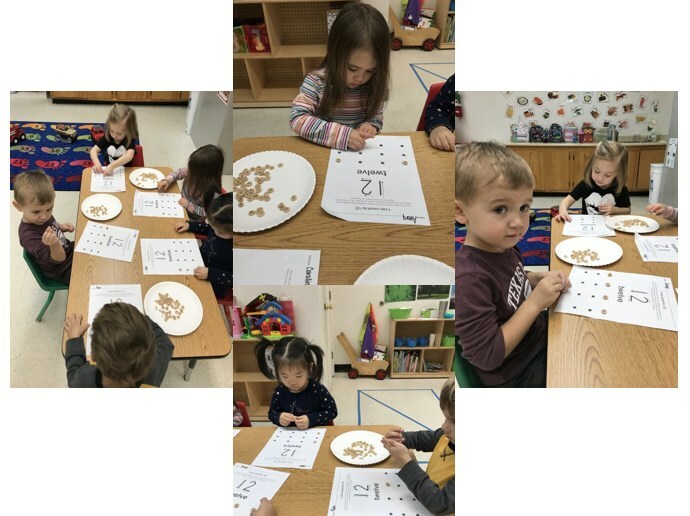 This is done through the use of flash cards, language, literacy, grouping objects, and the repetitive pattern association by counting the numbers in order from 1 to 12. The students are better able to articulate the world around them, by learning numbers and counting. Having the ability to recognize numbers and use them as a descriptive tool, will set them up for Pre-K 3. They will already be familiar with the base components of numbers and ready to expand their comprehension. These Eagles will be ready to soar to the next level! It is always exciting to see the students grasp the concept and internalize it. Parents are also enthused to see their child’s confidence build as they demonstrate what they are learning. How Can Your Child Benefit from a Quality Early Learner Program? While these are not the mainstay of an early learning program, they constitute a mindset that undergirds effective program services. I had the pleasure of managing several early childhood research projects with Dr. Susan Landry, Developmental Psychologist and Director of The Children’s Learning Institute known worldwide as the pre-eminent source for proven clinical and educational programs covering early childhood through late teens. Research shows that providing a high-quality education for children before they turn five yields significant long-term benefits. One well-known study, the HighScope Perry Preschool Study, found that individuals who were enrolled in a quality preschool program ultimately earned up to $2000 more per month than those who were not. Young people who were in preschool programs are more likely to graduate from college, to own homes, and have longer marriages. Learning does not stop once you pick your son or daughter at the end of the day. You may notice more interest in books or the world around them. Their gibberish is more active and focused on people and/or things. Their attention is starting to span longer periods of time or their interests are changing focus. The curriculum we have chosen at Ascension focuses on the whole child. It encompasses the main developmental milestones with not just your child in mind, but also with your active lifestyle. The information is concise in a friendly at-a-glance format. Our staff is trained on a daily basis along with attending major early childhood conferences. Early Learner Program (ELP) Teachers are not diagnosticians or therapists; however, it must be realized that it is the teacher of young children who is often the first to recognize that a problem may exist. (Passche, Gorrill, & Strom, 2004). Months before your son or daughter is transitioned to their next developmental age classroom we are looking for signs of readiness. We understand that this does not happen at the same time for each early learner. It is our goal at Ascension to collaborate with you, our Parents in promoting the development of your infant and toddler as they cross major thresholds of growth. As parents, you are making an investment in your son or daughter's academic, social and emotional development. We anticipate that our partnership will yield both early and long-standing returns on that investment. As always, if you have any questions about your child, their individual level of care, or any aspect of the early learner process, we are always her to respond. Paasche, C. L., Gorrill, L., & Strom, B. (2004). Children with special needs in early childhood settings. Clifton Park, NY: Thomson/Delmar Learning.